The land which the Club, Course and surrounding Neighborhood are situated was once rich and fertile farmland belonging to several families – all who also had the good fortune of holding spectacular views of the Linkhorn Bay providing, in the day an abundance of fish and shellfish indigenous to those waters. By the early 1900’s Birdneck was divided into five areas – land to the west of Cardinal Road belonged to the Miner family, to the east was held by Mr. Hurdle and beyond that was a forty-acre tract extending northward across the point owned by the Stormont family. The balance of the land was held by the descendants of John Ackiss, High Sheriff in 1769 whose property, some thirty acres from the end of Bobolink south to the inlet and north to where the Clubhouse now sits. The remainder of the Point belonged to the Miller family. An arrangement was secured with the owners of the Cavalier Hotel (built in 1927) to facilitate the recreational needs of hotel guests. Upon Mr. Crane’s untimely and tragic death in 1938 while duck hunting on the James River the golf course was purchased from his estate by the Cavalier Hotel and was thereafter know as Cavalier Country Club. The owner of the hotel, Mr. Sidney Banks (not related to the course architect) was a very positive force in the growth and improvements to the Club, its amenities and towards the neighborhood in general. 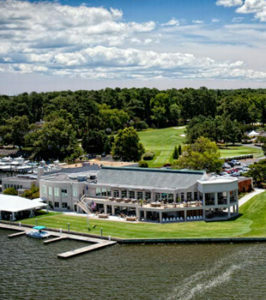 On March 22, 1947 the Club’s manager announced that the facilities at Birdneck Point would now be known as the Cavalier Yacht and Country Club, a private, non-profit club for the exclusive use of the Members and their guests and would be directed by officers and a board of directors. Later that same year an extension was planned to the 55 foot pier in anticipation of extensive dredging of the Lynnhaven Inlet which would open up Broad and Linkhorn Bays to larger boats. Other improvements were announced including a 200 seat dining room (although not completed until 1959), shuffleboard and paddle tennis courts and anchorage for seaplanes for guests arriving by air. By the summer of 1952 the Club was considered to be one of the mid-South’s major Yacht Clubs, its marina accommodating some 75 yachts and cruisers on their dual 200 foot-long piers. After a series of storms that caused significant flooding to the Club lower levels in the early 2000’s, the Club Governors found themselves with opportunity to move the Club Member Quarters to the upper level of the Club and thus, out of harm’s way. In the spring of 2011 the Clubhouse was reopened with a transformation into its current configuration, complete with resort styling and ambiance, captured by the addition of the Redan Deck overlooking Linkhorn Bay and the famous 18th finishing par-3, designed and named for the famous C. B. McDonald’s “The Redan” located on the West Links at North Berwick, Scotland. Coupled with The Banks Grille and Lynnhaven Dining Room, the Members of the Cavalier have been provided with a variety of dining and entertaining options unparalleled in the area. The dedication and legate nature of the Members of the Club coupled with their commitment to maintaining its heritage will keep the Cavalier Golf & Yacht Club improving and reinventing itself towards better serving its membership for years and years to come.